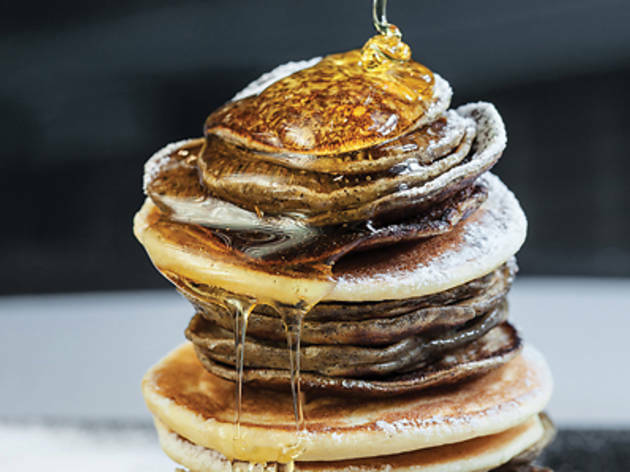 This funky little Sai Ying Pun corner spot, the latest culinary concept from the founders of Sheung Wan’s Common Ground café – twin brothers Caleb and Joshua Ng – dishes up sweet and savoury pancake ‘tapas’, paired with original cocktails. 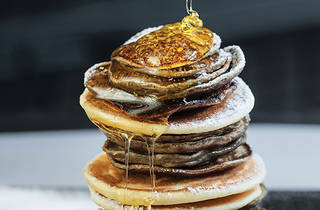 The menu is simple and creative: eight pancakes matched with cocktails, plus a handful of sides. We start with the 12H78C ($98) – that’s code for short ribs, slow-cooked for 12 hours at 78°C. While the barbecue ribs themselves are tasty, we’re disappointed by the buckwheat pancakes on which the ribs are perched. They’re measly, bland rounds – certainly not the stars of this small plate. The dish pairs well with Alcoholic’s Breakfast ($108), a vodka-based tipple with a jolt of caffeine. We fare similarly with the other savoury pancakes that we sample, like Pearl ($128) and Chu ($128) – enjoying certain aspects apart from the pancakes themselves. Our final sweet pancake selection – Running Honey ($58) – is the saviour. These golden brown, fluffy hotcakes are a honey-coated delight, from the silky honey butter to the crunchy honeycomb shards. Stack 1 Third St, Sai Ying Pun, 2549 9787; stackconcepts.com. Dinner for two: $600.